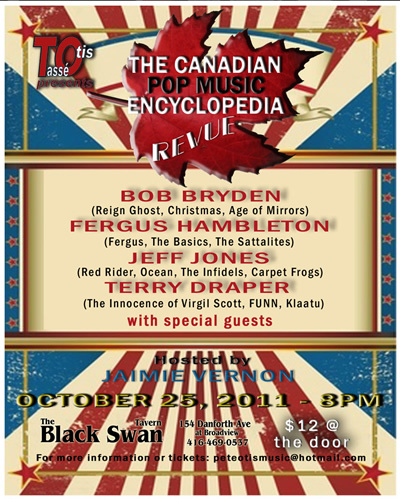 Vernon, who put the Encyclopedia online July 1, 1998, is about to launch this long-in-production history of Canadian pop music in book form in early November. As part of the promotional push he has teamed with Tassé and Otis to create a night of classic Canadian musical entertainment that would feature artists profiled in the book. October 25th will be the first of what the group hopes will be a successful monthly series. Says Vernon, “The first show will feature singer-songwriters like Fergus Hambleton of The Sattalites, Bob Bryden of Christmas/Reign Ghost, Jeff Jones from Red Rider/Ocean, and Terry Draper of Klaatu and some surprise guests. We’d like to have additional nights featuring rock, pop, blues, country and soul/R & B as a means to re-introduce some of Canada’s historic artists as well as up-and-comers back into the fabric of the current music climate. The end goal is to make this either a road show or franchise in other Canadian cities. We have so much talent in this country dating back 50 years and it’s time the public got to experience those amazing performers and songwriters all over again. The October 25th show will also allow attendees to pre-order the book for those that haven’t done so. Future shows are expected to feature the finished book itself. Artists will also be selling their own merchandise as well allowing fans to interact with them one-on-one.